As many people know, Mike is the founder of the South Bay Harbor Trail Coalition and was the spark that made the trail happen. 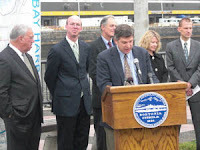 Many thanks to him, Save the Harbor/Save the Bay, Mayor Menino, Gillette/P&G, and everyone else who worked hard to make this project a reality. 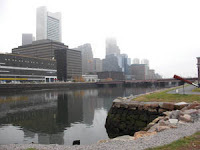 City and state officials marked the formal launch of work on a new bicycle and pedestrian pathway yesterday designed to open Boston's waterfront to formerly landlocked neighborhoods. 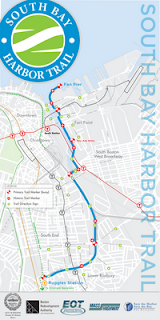 Organizers say the 3.5-mile South Bay Harbor Trail will link inland areas such as Roxbury, Chinatown, and the South End to the waterways of Fort Point Channel and the Seaport district by Fan Pier. It will also serve as a much-needed recreational connection for cyclists and pedestrians downtown to get from the Rose Kennedy Greenway to the Arnold Arboretum and the Emerald Necklace, they say. In the planning stages since 2001, the project was led by Save the Harbor/Save the Bay, a nonprofit advocacy group, and was developed in conjunction with the city and state, said Patricia A. Foley, president of Save the Harbor.